The Music Room in one of Scarlet Lady's Rockstar suites. (Image courtesy of Virgin Voyages). Virgin Voyages intends to take the rock star lifestyle to sea. 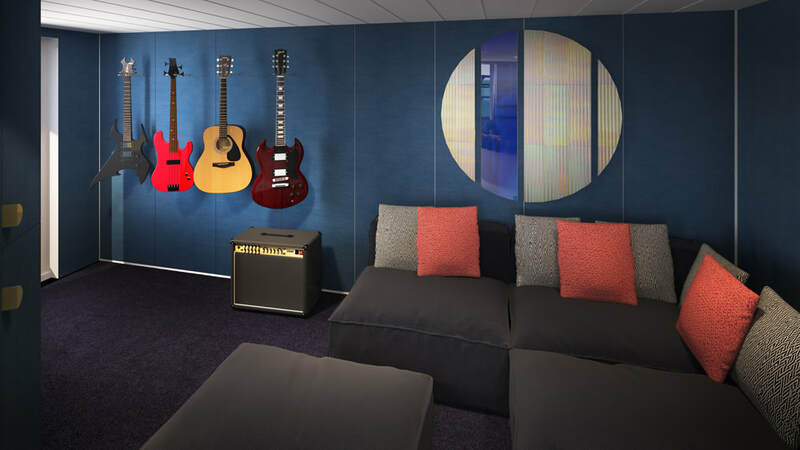 Its first ship, the Scarlet Lady, being constructed by Italy's Fincantierri, is scheduled to go into service in 2020 and last week the cruise line has announced that the suites on the Scarlet Lady will feature a rock star theme. This does not mean that the suites will be equipped with groupies and illegal drugs nor will dropping the television out the window be considered acceptable entertainment. Rather, it means that the suites will incorporate the type of modern luxury that rock stars and other contemporary celebrities expect in their accommodations. The “adult-by-design” Scarlet Lady will only feature 78 total RockStar Suites. These suites were designed by Tom Dixon of Tom Dixon's Design Research Studio. Scarlet Lady will have 8 different variations of the RockStar Suites, detailed below. Each suite features a sea terrace, electric, adjustable lighting including blackout curtains and a gold-plated vinyl record player accompanied by an en-suite collection of classic records. Fab Suite - At 950 sq. ft., an open wall separates the space into distinct bedroom and living areas, featuring an extra-long sea terrace with an outdoor shower, stargazing loungers, a hammock and a champagne table. ​Brilliant Suite – The 482 sq. ft. brilliantly designed suite has an open plan featuring a stocked bar with record player and sea terrace complete with a hammock swing chair.